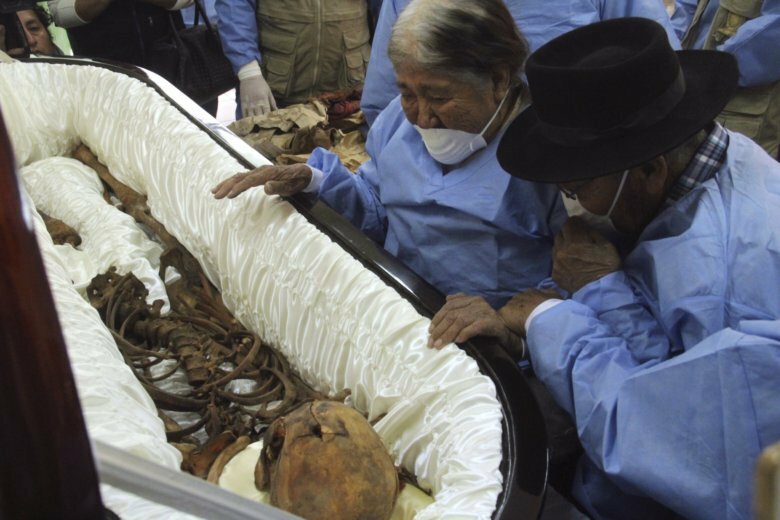 HUAMANGA, Peru (AP) — An octogenarian couple in Peru has received the skeletal remains of their son from authorities more than three decades after he was taken away by soldiers during the darkest days of the Andean nation’s fight with Maoist rebels. Gregoria, 88, even composed a song in the native Quechua language to express the family’s grief at not knowing the fate of their son. “It was an obsession,” said Elder Chipana, the couple’s grandson and nephew of Cesareo. Authorities hope that in the future thousands of Peruvian families who have spent decades wondering about loved ones who disappeared during the conflict won’t have to wait as long for closure. This month, for the first time, the remains of 14 people were turned over to loved ones under a new law that seeks to streamline the lengthy and burdensome process to identify those killed in the conflict. Under the measure, authorities can turn over remains uncovered by forensic scientists before determining a cause of death or completing an investigation. Families are also no longer required to file a complaint with the chief prosecutor’s office first. Last Saturday, they finally bid farewell to their son in a family mausoleum in Huamanga. A small band played popular Andean music as his maroon-colored coffin was paraded through the city that for years was the setting for a solitary battle they hope other families won’t ever have to repeat. Briceno reported from Lima, Peru.